It wouldn’t be a Tandempalooza trip if I didn’t have at least one post dedicated to food! During our time in SoCal, we are lucky enough to discover that our favorite bar in CDM is having a four-course, four-beer Allagash dinner. We are thrilled when we find out there is space and we can attend. 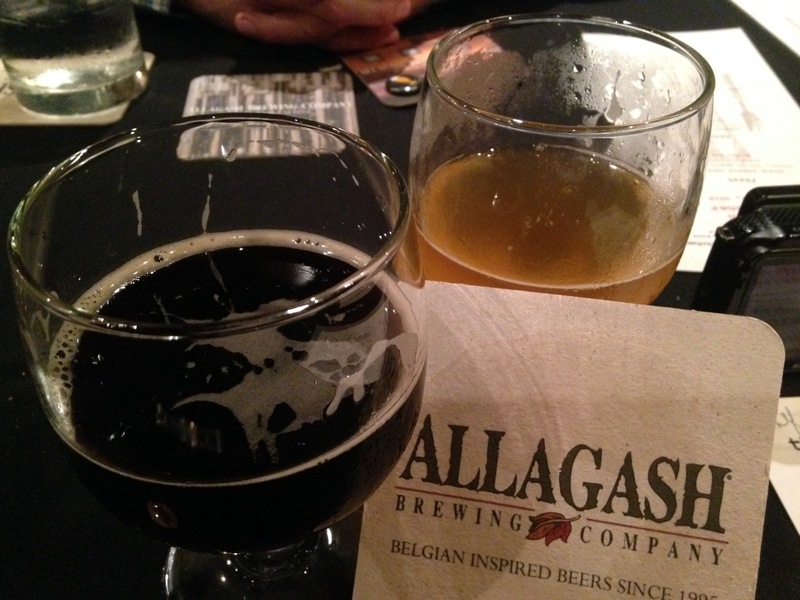 Allagash is one of our favorite breweries, and about 18 months ago we went all the way to Portland, Maine to visit. 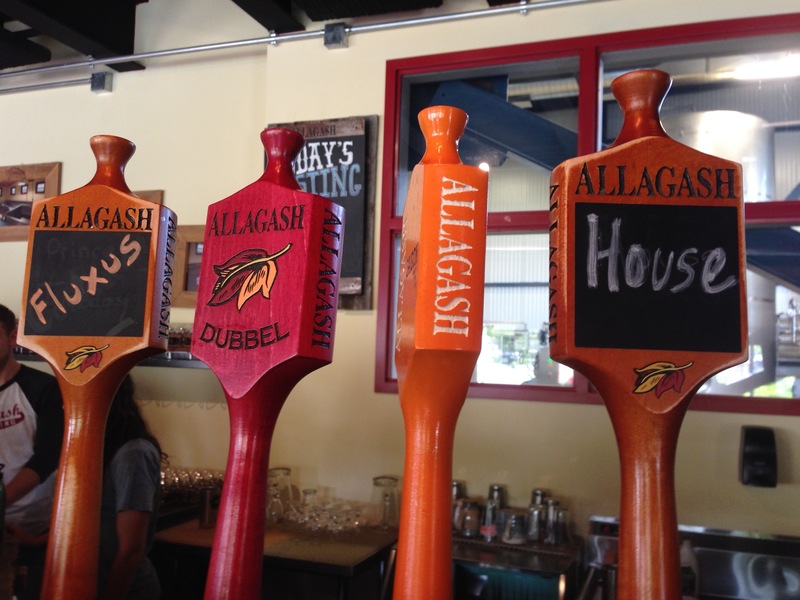 July 2014 at Allagash Brewery, Portland Maine. 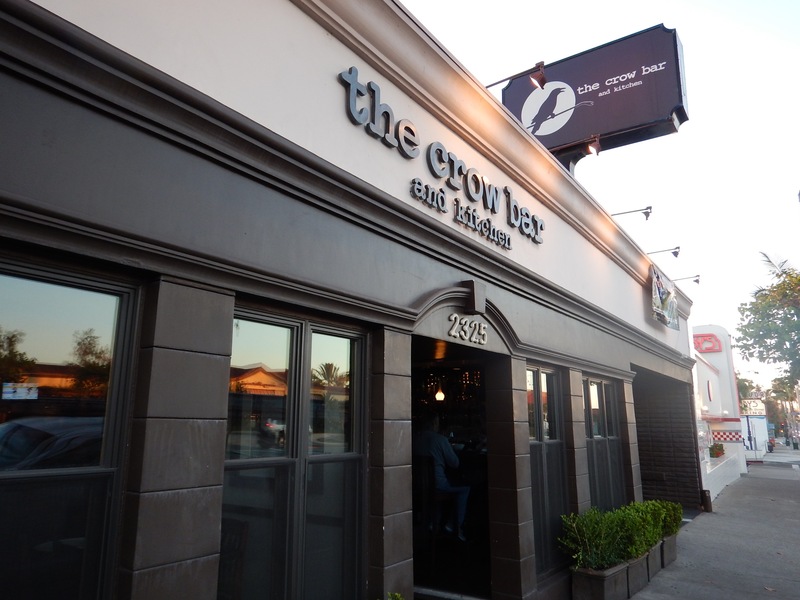 On this night in October of 2015, we are at The Crow Bar and Kitchen. The dinner is being held in a private room downstairs. We have eaten at the Crow Bar many times, and have brought many friends here, but we had no idea this room even existed. 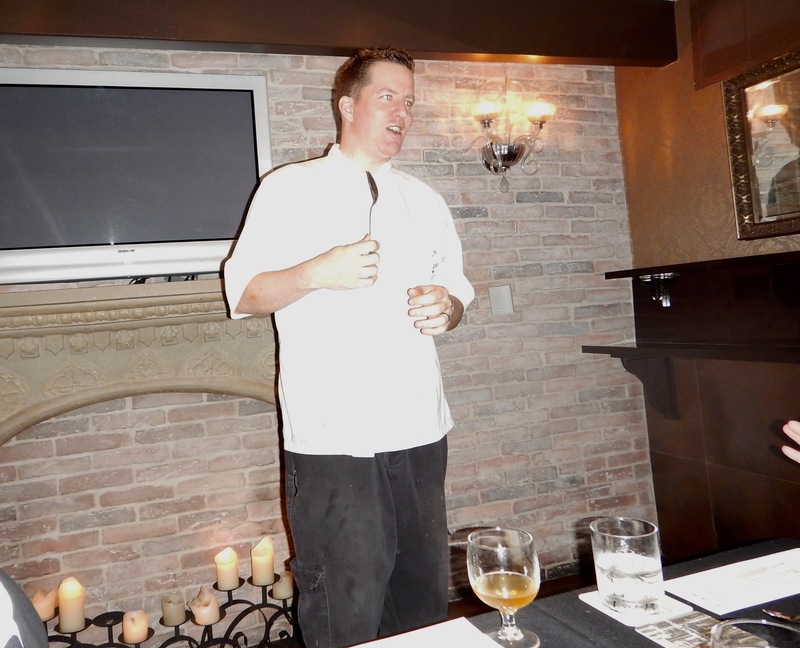 Tonight Chef Matthew Robinson will pair four courses with four beers, and he will share his thoughts on each course. Chef Matthew is really excited about his creations, and sharing them with us. We are sitting next to the host of this event, Sarah Seddon, she is responsible for sales in SoCal and one of her responsibilities is attending Allagash events (it’s rougher than you think because she can’t drink that much beer since she has to drive home)! She is quite knowledgeable, and proves to be an insightful dinner and drinking companion. The first course is citrus roasted baby beet. 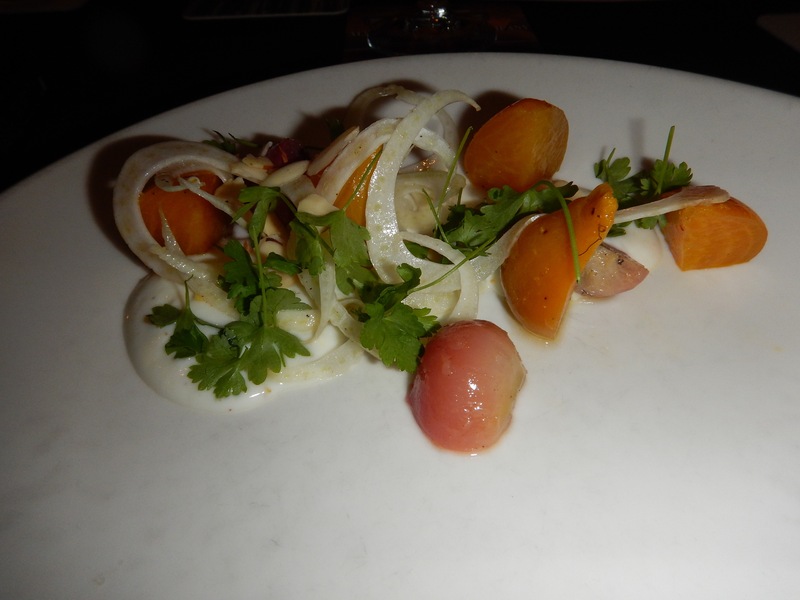 It features fennel, spiced yogurt, almond and pecorino romano. This is probably the best beet I have ever had. I like beets, but Roger and several others are not particularly fond of beets and still find this to be a wonderful dish. It might make you reconsider this often-maligned veggie. Paired with the beet salad is the Golden Brett. This beer is a red wheat aged in oak. The ABV is 7.7%. The pour is around 5 to 6 ounces. 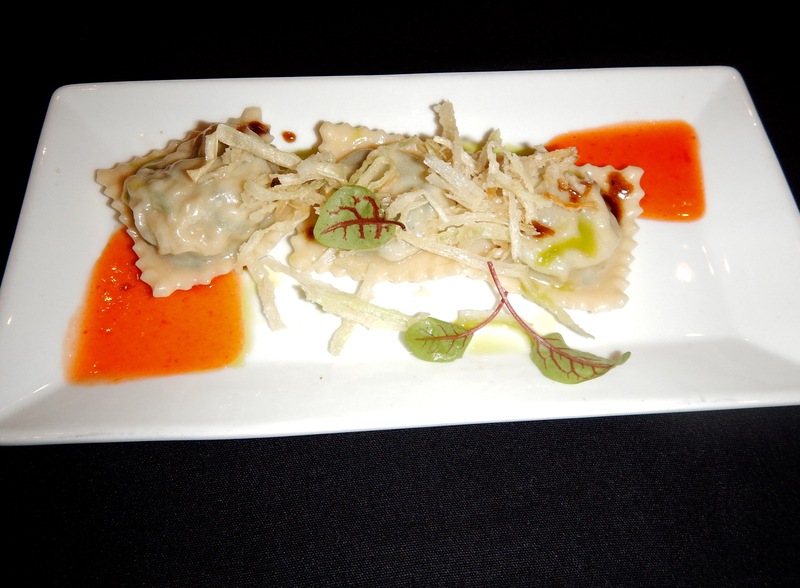 Next up is lobster ravioli with mint and fresno jelly. This dish alone is worth the price of admission! The lobster is perfectly cooked inside a tender, fresh pasta pocket. The lobster is a special nod to Allagash’s home roots in Maine. I wish I had cut one in half for the picture so you could see how pretty it is. The beer for the second course is called Confluence. 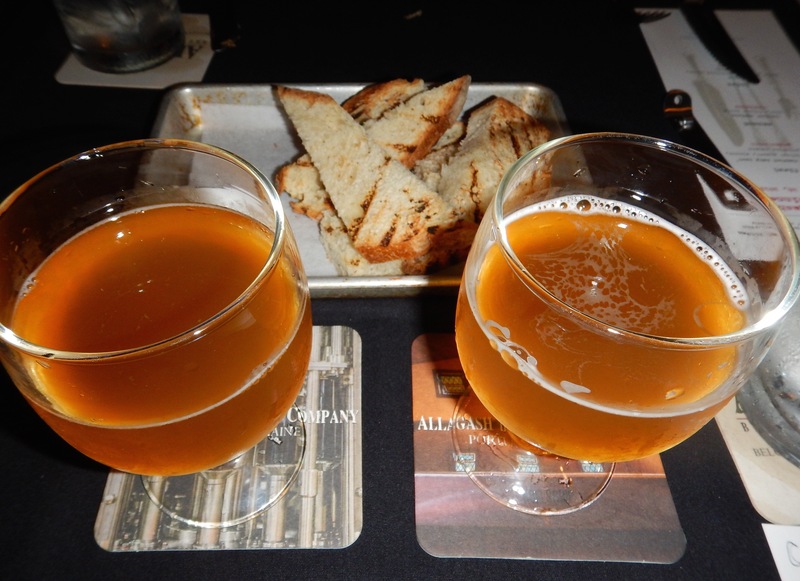 It’s a Belgian-style ale aged in stainless steel and the ABV is 7.1%. 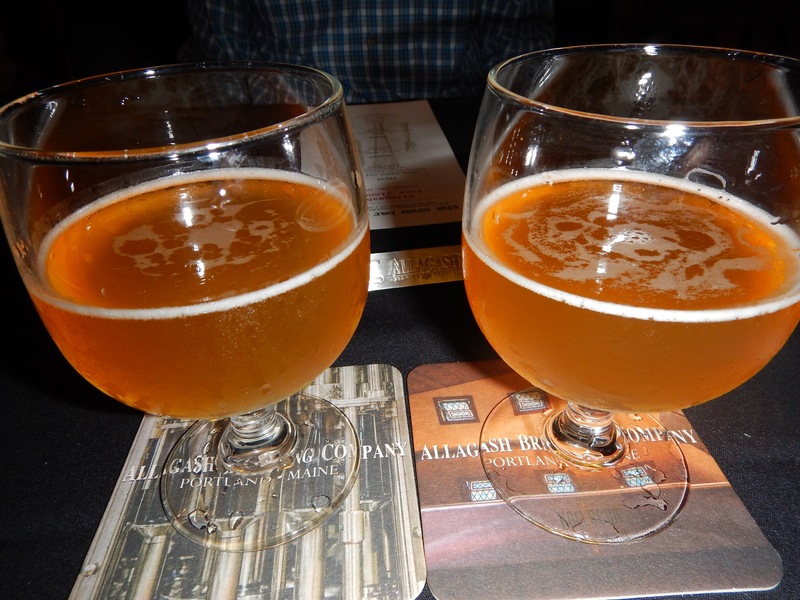 Interestingly, these are the same beers, but one has more sediment because it came from the bottom of the bottle. Allagash Sarah tells us they should have swished the bottle before serving. The third course is duck. 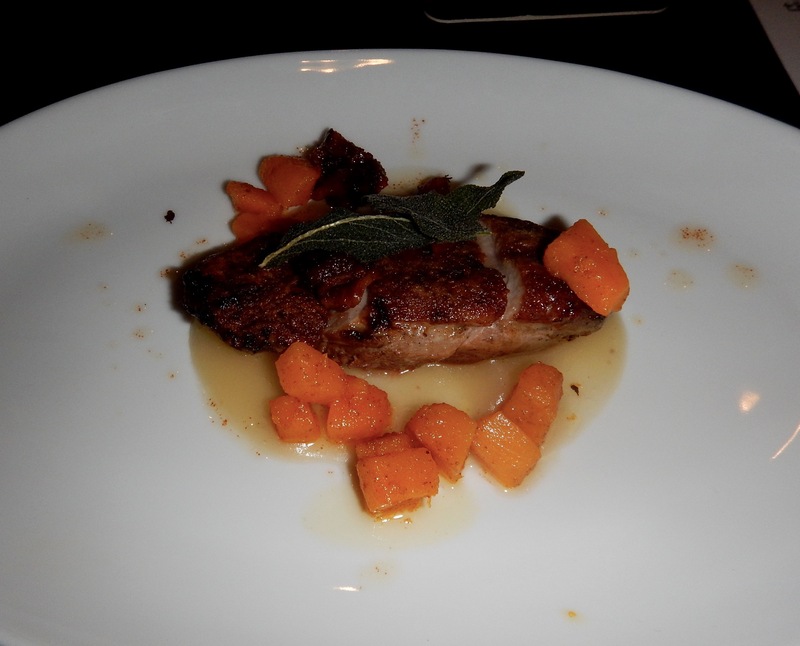 It’s served with apple puree, caramelized bacon, carrots and fried sage (on top). The duck comes medium rare. The beer pairing is one of Roger’s favorites. 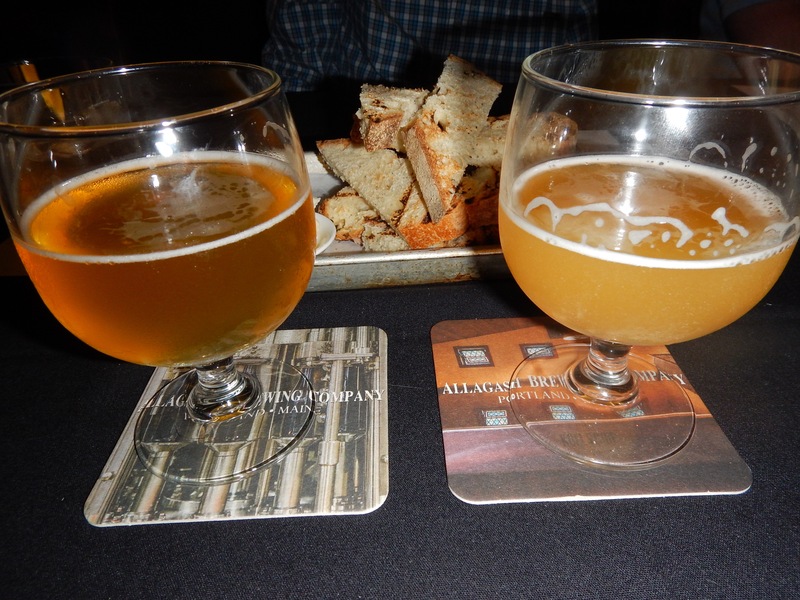 Curieux is Allagash’s second most popular beer (behind Allagash White). It’s a tripel ale that’s aged in Jim Beam bourbon barrels for eight weeks. It comes in at a whopping 11% ABV, so it’s pretty potent. The last course is called crow fudge. 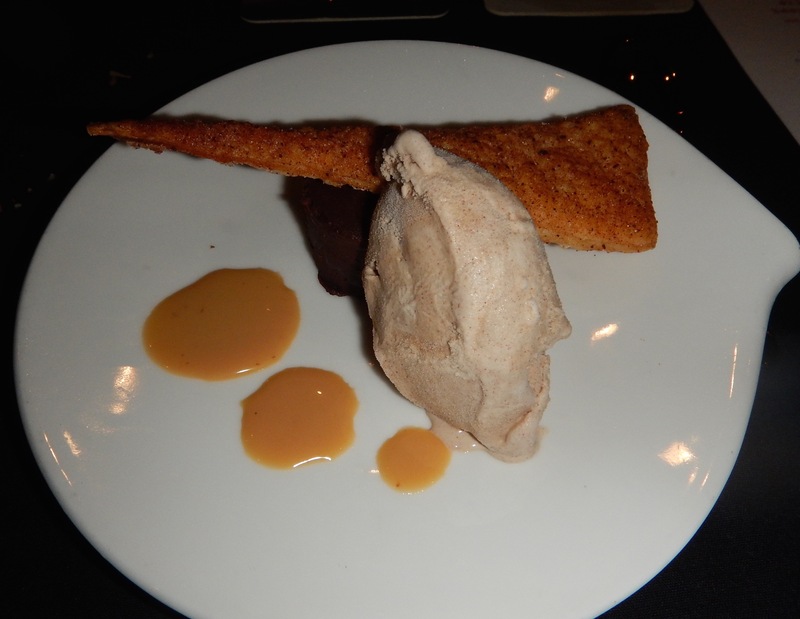 Its a churro, dulce de leche and cinnamon gelato. It is a marvelous finish to an incredible meal. 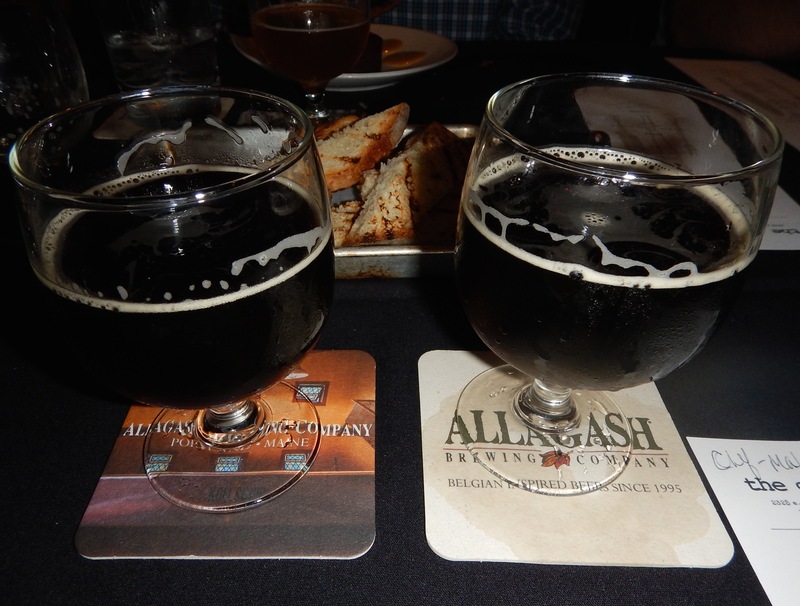 Dessert is served with Allagash Black, a belgian stout with an ABV of 7.5%. Allagash Sarah has to leave us but she wants to buy us each another round. I don’t really “need” another beer, but we are walking home and we are all feeling very happy so Roger requests another Curieux and I choose the Black. A generous parting gift from our host. Fortunately, we remember where our house is. This has been a great meal and we hope the Crow Bar is doing another one of these dinners the next time we are in California. Follow the blog and you will receive an email the next time we are on an exciting adventure!